The screeners for the first six episodes have gone out to members of the press. Along with those screeners, a nice blanket with an Outlander season four print is the newest swag for press members. We hope that this item becomes available for Outlander fans to purchase. 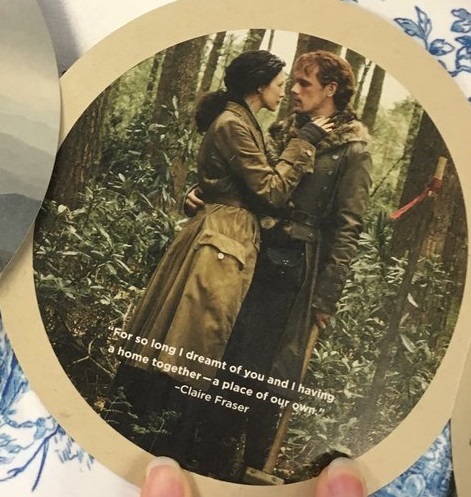 Along with one of the photos of the blanket, we can see a new photo of Jamie and Claire in the woods. It looks like Jamie is holding a version of a sledgehammer and there is a post with a ribbon on it. Could this be for the framing of their house? Below is that photo from Kara Warner of People Magazine, and I have also included other photos of the blanket. This entry was posted in Caitriona Balfe, Production Photos, Sam Heughan and tagged Caitriona Balfe, Merchandise, Official Photos, Sam Heughan, Season Four by Sarah Ksiazek. Bookmark the permalink.